Victoria Tauli-Corpuz is an indigenous leader from the Kankanaey Igorot people of the Cordillera Region in the Philippines. 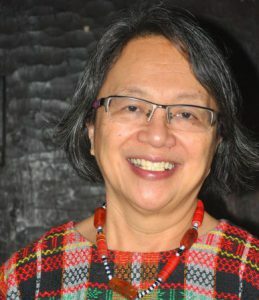 Is a social development consultant, indigenous activist, civic leader, human rights expert, public servant, and an advocate of women’s rights in the Philippines. She was the former Chair of the UN Permanent Forum on Indigenous Issues (2005-2010). As an indigenous leader she got actively engaged in drafting and adoption of the UN Declaration on the Rights of Indigenous Peoples in 2007. She helped build the indigenous peoples’ movement in the Cordillera as a youth activist in the early 1970s. She helped organize indigenous peoples in the community level to fight against the projects of the Marcos Dictatorship such as the Chico River Hydroelectric Dam and the Cellophil Resources Corporation. These communities succeeded in stopping these. She is the founder and executive director of Tebtebba Foundation (Indigenous Peoples’ International Center for Policy Research and Education). Ms. Tauli-Corpuz has founded and managed various NGOs involved in social awareness raising, climate change, the advancement of indigenous peoples’ and women’s rights. A member of the Kankana-ey Igorat peoples, she was the chairperson of the United Nations Permanent Forum on Indigenous Issues. She is an Expert for the UN High Commissioner for Human Rights and has served as the chairperson-rapporteur of the Voluntary Fund for Indigenous Populations. She is also the indigenous and gender adviser of the Third World Network and a member of United Nations Development Programme Civil Society Organizations Advisory Committee. She became a Member of the World Future Council in September 2017.